Mum Bett was among the first black slaves in Massachusetts awarded freedom in court under the 1780 constitution, and a decision that slavery was illegal. Her county court case, decided in August 1781, was cited as a precedent in the Massachusetts Supreme Judicial Court appeal review of the Quock Walker case. When the state Supreme Court upheld Walker’s freedom under the constitution, it was considered to have informally ended slavery in Massachusetts. When Elizabeth Freeman was nearly 70 years old, Susan Ridley Sedgwick painted a miniature portrait of her in watercolor on ivory. Sedgwick was the young wife of Theodore Sedgwick, Jr., whose father had represented Freeman in her claim for freedom from slavery under the Massachusetts Constitution of 1780. Phillis Wheatley was born circa 1753 in West Africa, and was very likely kidnapped into slavery. She was named for the slave ship, Phillis, that brought her to Boston on July 11, 1761. She was purchased as a personal slave to Susannah Wheatley, wife of tailor John Wheatley, a prominent Boston merchant with a wholesale business, real estate, warehouses, and the schooner London Packet. Phillis was evidently around 7 years old at the time, and took her new master’s surname. A frail child, Phillis was chosen to be a domestic servant and companion to Susannah Wheatley, an ardent Christian, in her later years. Although she spoke no English upon her arrival in this country, Phillis soon proved to be a precocious learner, and was tutored by the Wheatley’s daughter Mary in English, Latin, history, geography, religion, and the Bible. Young Phillis quickly learned to speak English and to read the Bible with amazing fluency. In 1626, a ship carrying 11 male slaves sailed into the harbor at New Amsterdam. They were immediately put to work by the Dutch West India Company building roads, cutting timber, clearing land and helping construct a major fort at the southern tip of Manhattan. For the next 38 years – until the British took over New Netherlands and renamed it New York – the Dutch slowly increased the numbers of slaves in the colony, including the settlements on western Long Island. Some slaves were imported directly from Africa, but the Dutch officials preferred to buy slaves who had been “seasoned” by a few years of living in the West Indies. By then they had gotten used to working as slaves, had picked up some of the new language, and in many cases had contracted and survived a bout with the killer disease smallpox, thus becoming immunized. Jenny Slew was born circa 1719 to a free white woman and an enslaved black man. That fact would become the core of an historical legal case forty-six years later in Ipswich, Essex County, Massachusetts Bay Colony. Jenny contended that her parents had married and established a home and family. Jenny Slew had been raised free and lived all her life as a free woman, but in 1762 she was kidnapped and enslaved by John Whipple. In most of the colonies, she would not have been able to turn to the law for help. As a slave, she would have been banned from the courts. However, by that time in Massachusetts an enslaved person could bring a civil suit. The tavern was on the waterfront in 1741 and its doors were open to blacks and poor whites, and it had a bad reputation among the respectable citizens of New York City. Exploiting its proximity to plantations in the British colonies in North America and the West Indies, King Charles II of Spain issued the Edict of 1693, which stated that any male slave on an English plantation who escaped to Spanish Florida would be granted freedom provided he joined the Militia and became a Catholic. This edict became one of the New World’s earliest emancipation proclamations. Spanish rules about slavery were very different from those of the English. Spanish slaves could own property, could buy their freedom, could sue their owners and separating families was prohibited. 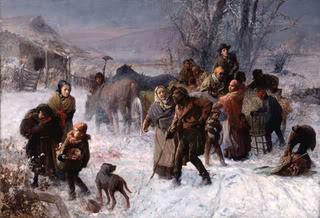 Word of the Spanish policy of giving sanctuary to escaped slaves spread rapidly among the black population in the Carolinas and Georgia, and the number of escapees steadily increased. By 1738, more than 100 Africans had reached St. Augustine, prompting the Spanish to establish Fort Mose (pronounced Moh-Say) and a nearby community named Gracia Real de Santa Teresa de Mose, two miles north of St. Augustine, Florida. The settlement included a four-sided fort, houses and fields. The baby whose slavery name would become Lucy Terry was born in Africa around 1724. Slave traders sold her in Rhode Island – which dominated the colonial American slave trade – in about 1730. During the period when Lucy arrived, the rum-slave-molasses traffic from Newport or Bristol to Africa and the West Indies was in its early development. It is highly likely that Lucy was taken from Rhode Island to Enfield, Connecticut, which would explain why she was known as Lucy Terry. Since most blacks weren’t named until they were purchased and transported to their owners, Lucy probably came to be called Terry through an association with Samuel Terry, one of the early settlers and founders of Enfield. 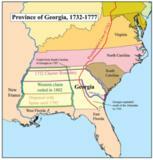 Between 1735 and 1750, Georgia was unique among Britain’s American colonies, because it was the only one to attempt to prohibit black slavery as a matter of public policy. The decision to ban slavery was made by the founders of Georgia, the Trustees. 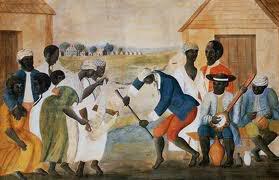 This well-known watercolor by an unidentified artist depicts people presumed to be plantation slaves dancing and playing musical instruments. It gives a rare view of African American life in South Carolina during the colonial period. The women are wearing head wraps and gowns with fitted bodices and long full skirts. Some of the men are wearing earrings. Although its setting is uncertain, materials in the files of Colonial Williamsburg suggest a plantation between Charleston and Orangeburg, South Carolina. Conditions in the South were favorable for slavery. Large stretches of fertile land, a warm climate that the Negroes tolerated much better than the whites, and unhealthy regions where white men did not care to work – all these drew slavery to America. Established first in the Spanish possessions of the West Indies, it spread as soon as the mainland was settled along the mainland, from Jamestown northward and southward. Many of the first slaves in North Carolina were brought to the colony from the West Indies or other surrounding colonies, but a significant number were brought from Africa. Most of the English colonists arrived as indentrued servants, hiring themselves out as laborers for a fixed period to pay for their passage. In the early years the line between indentured servants and African slaves or laborers was fluid. Some Africans were allowed to earn their freedom before slavery became a lifelong status.